Mission Creek is the Central Okanagan’s most important waterway, as it feeds Okanagan Lake, provides critical habitat for fish, wildlife, and plants, and delivers multiple historic, recreational, and economic benefits. In the 1950s, however, sections of Mission Creek through Kelowna, British Columbia were channelized and diked to prevent flooding. The resulting changes caused the loss of more than 60 percent of the creek’s length, 80 percent of its spawning and rearing habitat, and 75 percent of its wetland and riparian areas. Historical, cultural, recreational, and economic impacts have also become increasingly significant. 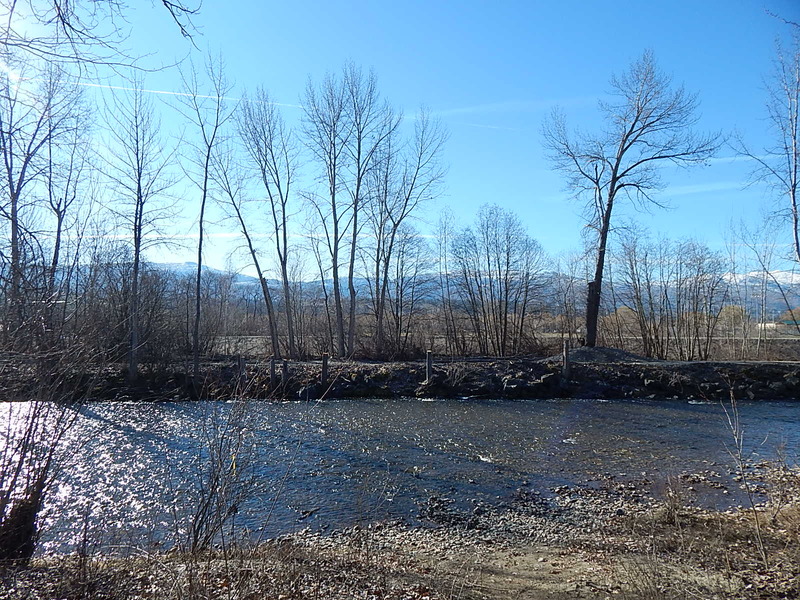 The Mission Creek Restoration Initiative (MCRI) was formally launched in 2008 to address declining fish stocks by restoring natural hydraulic and biological functions to the lower 12 km of Mission Creek from the East Kelowna bridge to Okanagan Lake. Formal MCRI partners include BC Ministry of Forests, Lands and Natural Resource Operations, Central Okanagan Land Trust, City of Kelowna, Fisheries and Oceans Canada, Friends of Mission Creek, Okanagan Nation Alliance, Regional District of Central Okanagan, and Westbank First Nation. Restoration activities include setting back the dikes to restore natural function, re-establishing the floodplain, reconnecting remnant oxbows, restoring fish habitat within Mission Creek, planting riparian vegetation, and creating wetlands and habitat for species at risk. Phase-1 construction is focused on two major integrated stages. 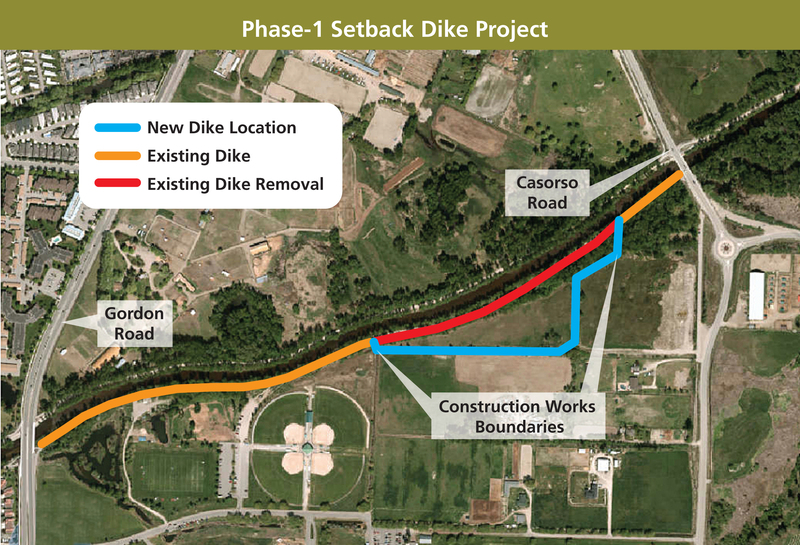 Stage 1 will renaturalize floodplain function by realigning a 500-metre section of dike on the south side of the creek between Casorso Road and Gordon Drive. Fish and wildlife stocks will be increased by enhancing their habitats within the expanded floodplain. This includes increased gravel stability within a section of Mission Creek that provides the most valuable kokanee spawning habitat within the entire watershed, as well as improvements to riparian habitat for a wide range of wildlife species. Stage 2 will restore important fish habitat features within Mission Creek, including meanders, pools, and overhead cover. This will increase rearing areas for kokanee and rainbow trout, and includes areas of refuge from high temperatures during summer low-flow periods, and from predators such as osprey, blue herons, ducks, and racoons. Built in the 1950s, the old dike was an emergency structure intended to prevent flooding of nearby residential and agricultural properties. The new setback dike is an engineered structure built to current provincial standards outlined in the BC Dike Design & Construction Guide. Preparation for dike realignment began in 2009 with technical studies that assessed the creek’s geotechnical make-up, hydraulic capacity, sedimentation, erosion, and flooding histories. A Biophysical Baseline Inventory (BBI) was conducted in 2014 and 2015 to provide current information about resident plant and animal species, and any species at risk. BBI surveys confirmed that the area is home to 82 bird species, three species each of amphibeans and reptiles, 11 species of mammals, and a number of unidentified bat species. All told, eight are provincially listed as ‘species at risk’ and several others are ‘theatened.’ These findings will inform planners on which areas need to be preserved, which need to be expanded, and how existing edges between habitat zones could be modified. 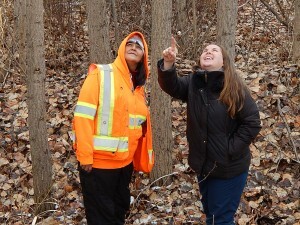 Tree assessments and surveying were also conducted during the research phase. The aforementioned data—including biological criteria, flow management and flood protection criteria, physical constraints, and design limitations―were used to develop detailed design specifications that are guiding all construction and restoration activities. The resulting Setback Dike Engineered Design Report was compiled by third-year engineering students with input and oversight from industry experts. It outlined how an existing 500-metre section of dike that runs through City of Kelowna land was to be set back about 150 metres, thereby expanding riparian areas by almost 400 percent. This will allow expansion of freshet flows from Mission Creek into the newly created floodplain. 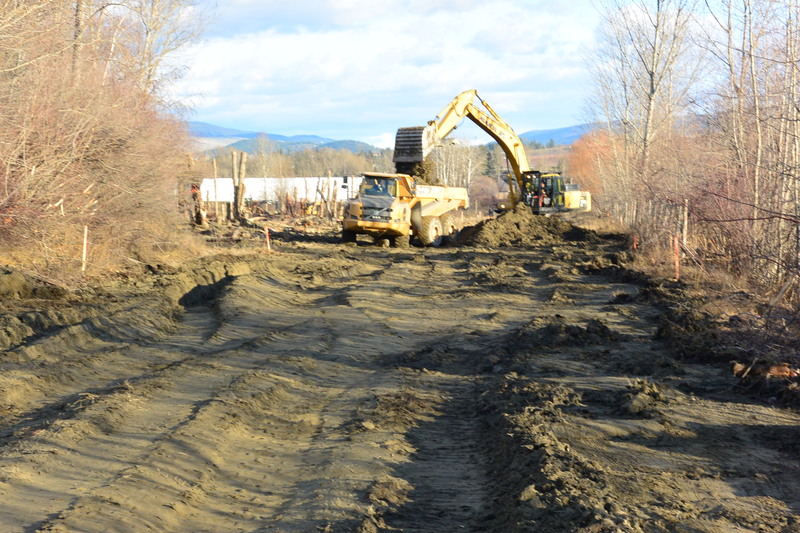 In addition, an existing natural side channel on the floodplain that was separated from Mission Creek when the original dike was constructed, will be reconnected to provide seasonal flow and fish access. This work will be complete by September 2016. 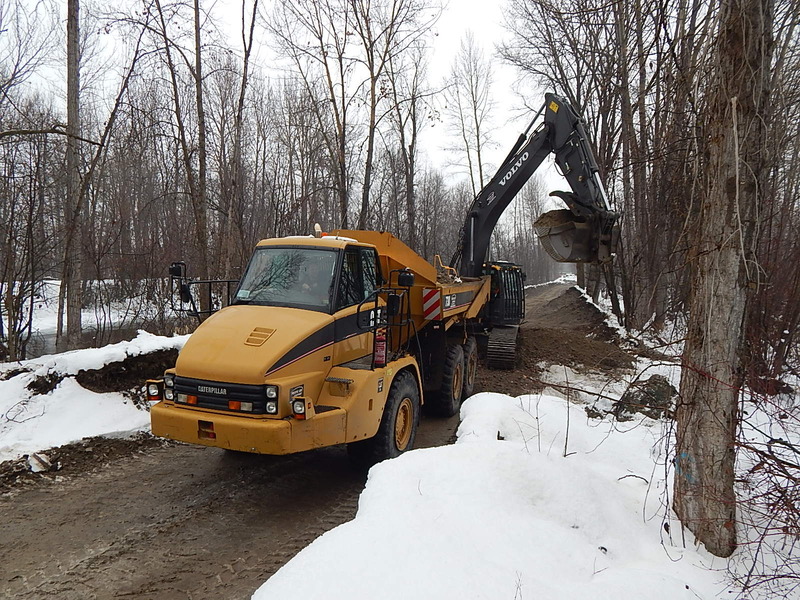 Dike realignment was scheduled during the period between November 2015 and March 2016, with all work conducted away from the creek to prevent any disturbance of fish eggs. Following a danger tree assessment, the site of the new dike was prepared by removing trees and vegetation. Tree removal specialists worked with the project engineer to minimize tree disturbance. Every effort was made to save large cottonwoods along the old dike by retaining dike structure around their roots. Of the trees that were removed, 36 with root systems intact are being stored for future restoration. Where needed, trees along the old dike were topped to reduce potential for nesting bird conflicts during fish habitat restoration work. Ecoscape Environmental Consultants conducted a Biophysical Baseline Inventory to identify and count resident species and species at risk. Removal of the old dike (left) and construction of the new dike (right) were scheduled during low-water times to prevent ecological damage. Trees and vegetation were removed from the site of the new dike, and along with hundreds of red ozier and other shrubs, were transplanted to the expanded floodplain. Mission Creek is an invaluable and much-loved environmental asset that warrants continual protection. To that end, MCRI created an Environmental Protection Plan (EPP) for construction, and a Riparian Management Plan (RMP) for subsequent restoration activities in and along the creek. Both plans were reviewed by experts within all levels of government, and the required authorizations were secured under municipal, provincial and federal legislation. All work is being undertaken according to applicable regulations, standards, and guidelines, and is closely monitored by qualified engineering and biological professionals. Environmental risks associated with dike realignment are low, as it was undertaken during the dry period, with no work occurring within the creek or adjoining wetlands. Fish habitat restoration work planned for summer 2016 will be focused along the water’s edge, using various strategies to minimize aquatic impacts. These include isolating the work area from flowing or standing water, and scheduling work during the approved instream work window that minimize risks to aquatic species. 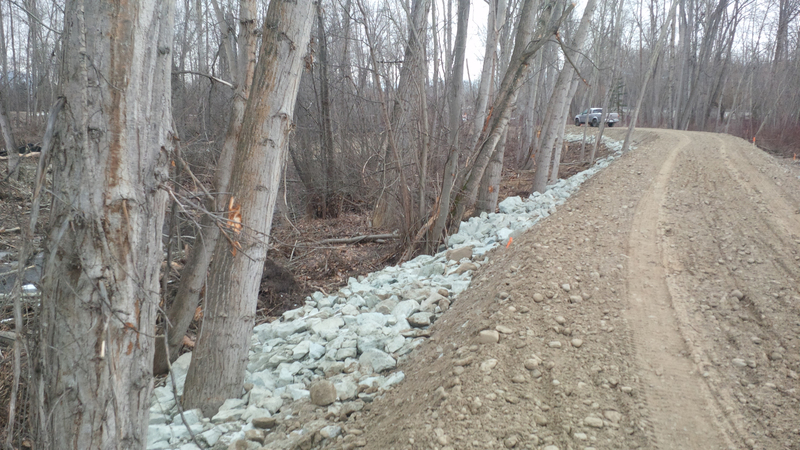 The RMP, along with pre- and post-construction monitoring, will ensure that sufficient creek-side vegetation is protected to preserve important wildlife habitat values, and to maintain bank and channel stability and bank shading. A follow-up work plan, outlining ongoing planting and maintenance, is also being developed to enhance riparian renewal over the coming months and years. To prepare for the dike set back, the former dike within the construction area was removed to an average elevation of 40cm above the creek’s current water level. About 8,000 cubic metres of fill were removed, most of which was reused in construction of the new dike. 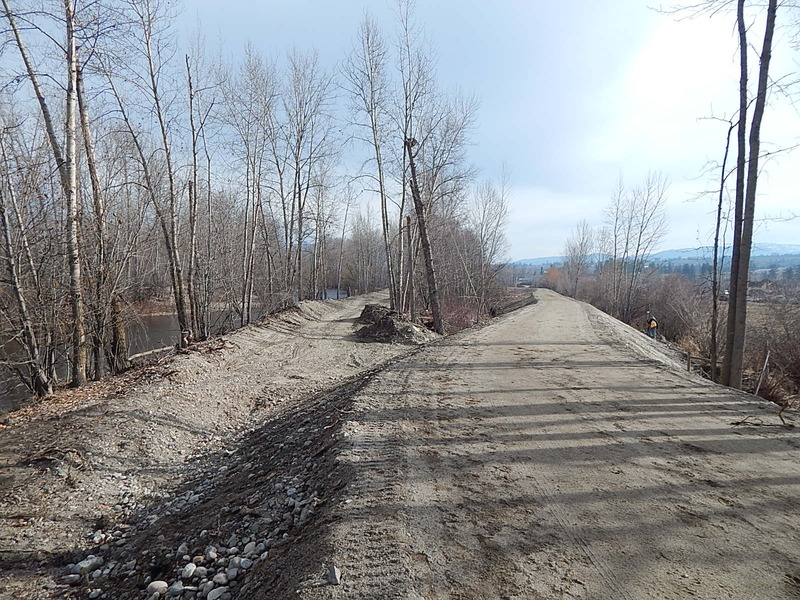 All dike deconstruction and reconstruction activities are being undertaken by City of Kelowna crews, who have a strong vested interest in getting the job done right. Designed to accommodate a one-in-200-year flood, the new dike reflects government standards and design specifications outlined in the Setback Dike Engineered Design Report. Construction took place during the low-water period, with no impacts on creek water quality. The new dike follows property lines shown in blue on the site plan on Page 1. Construction started from both ends of the 500-metre section, allowing for faster removal of material from the former dike. About 15,000 cubic metres of material were required. 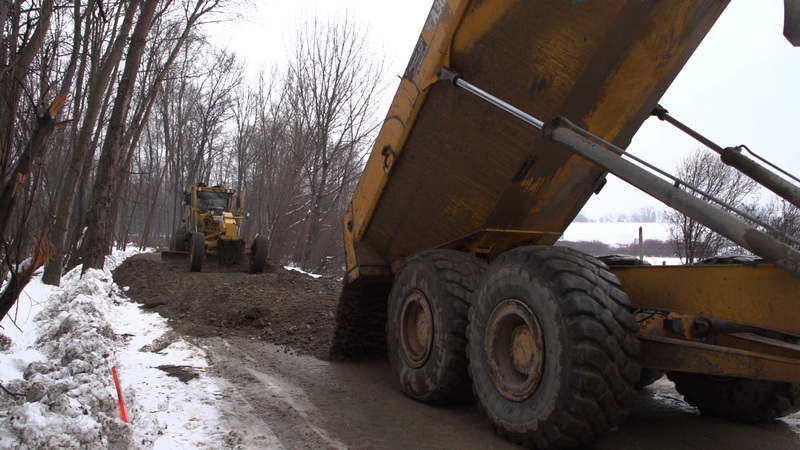 In preparation for construction of the new dike, about 2,000 cubic metres of topsoil and organic matter along the 500-metre by 12-metre alignment were removed and stockpiled for future city projects. The expanded floodplain, which covers almost two hectares of what was once pasture, will provide new habitat for fish, wildlife, and indigenous vegetation. Now that construction of the new dike is complete, all disturbed areas have been replanted with native vegetation. 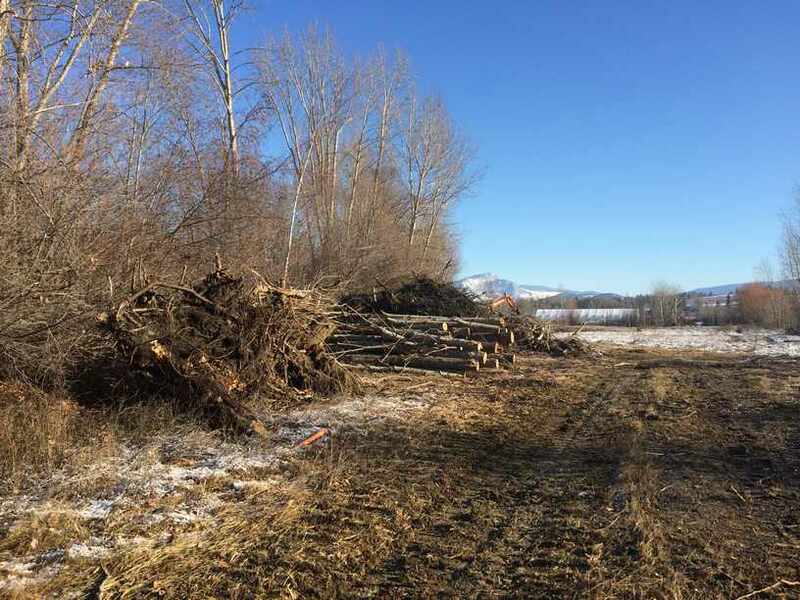 Some of the large cottonwoods that had to be removed from the old dike and new dike alignment were cut into twelve ‘stubs’ and excavated in to provide roosting and nesting habitat. Smaller trees were cut into hundreds of ‘stakes’ that were planted and will grow into trees. Hundreds of shrubs, including red osier, wild roses, oregon grape, dogwood, and other shrubs were also replanted. Two former ponds in the corner of the floodplain will become wetlands, as cattails from nearly ditches are planted. Nature will then take its course and the restoration will evolve over time, ultimately providing a broad range of ecosystem benefits. 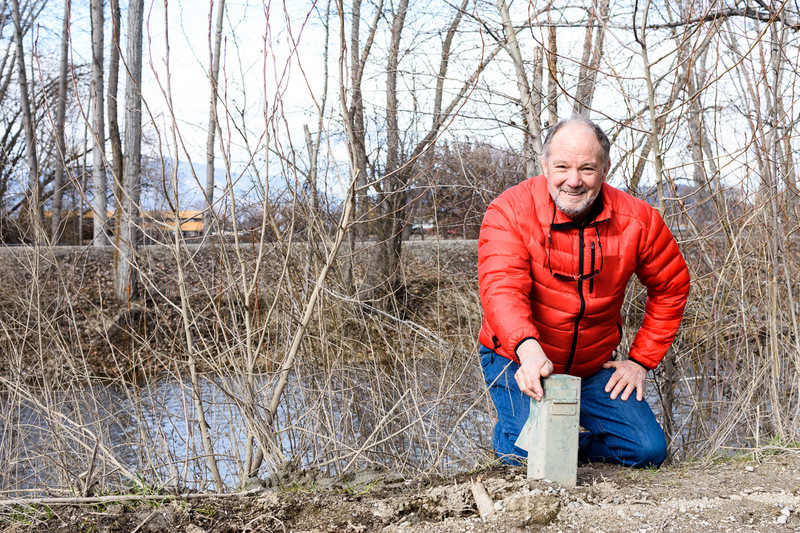 UBCO is providing the data loggers and the students to undertake the monitoring, which will also contribute data for a much more expansive regional groundwater monitoring project being undertaken by the Ministry of Forests, Lands and Natural Resource Operations. 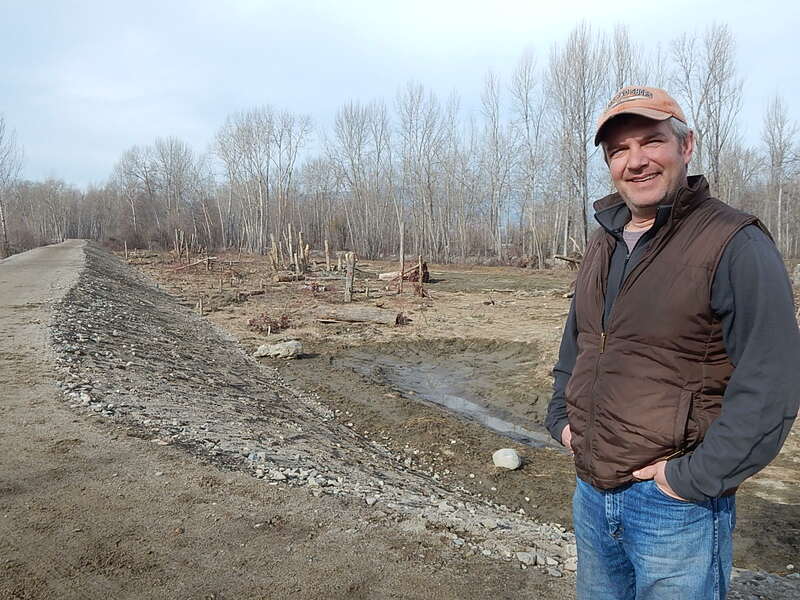 Interior Land Reclamation’s Mike Kamann removed cottonwoods along the new dike alignment and relocated them to the expanded floodplain. These and replanated shrubs will provide a variety of ecosystem benefits over time. Project engineer Don Dobson identifies one of the four monitoring wells that will help determine if the new dike impacts ground water levels over time. In keeping with government regulations and industry best practices, environmental and archaeological monitoring was conducted during the construction phase of the project. While construction was designed to minimize impacts, and took place during low-water months, monitoring ensured an added layer of protection, collaboration, and overall accountability. 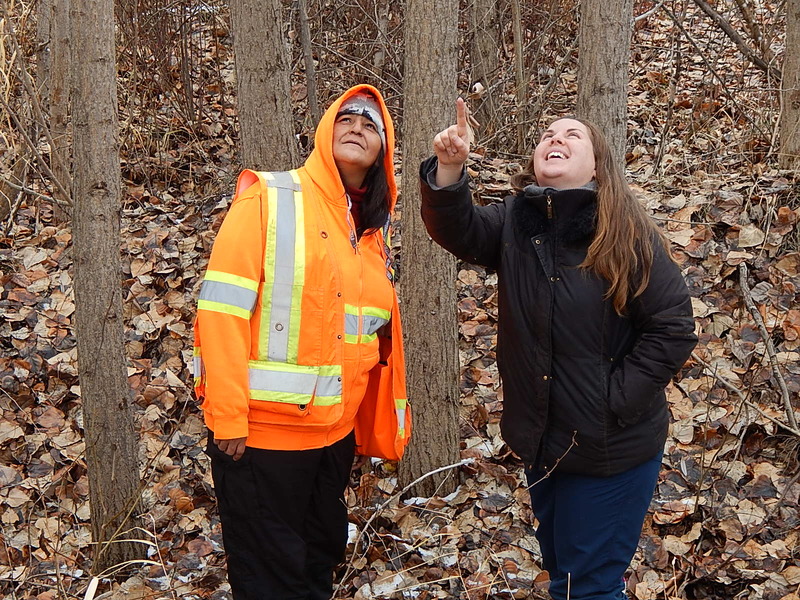 Okanagan Nation Alliance biologists monitored fish and wildlife habitat in and around the creek to ensure habitat disturbances, fuel spills, and sedimentation were minimized. Turbidity monitoring conducted by the environmental monitors confirmed that construction activities caused little erosion and no sedimentation in creek water. Mission Creek and the surrounding riparian areas are historically, culturally, and economically important to the Okanagan Nation. Past and present cultural uses include harvesting fish from the creek, hunting wildlife from the surrounding riparian corridors, and gathering nearby plants for food, building materials, and medicines. Many archaeological sites and artifacts remain along the creek today. During MCRI construction, these cultural resources were protected by a Westbank First Nation archaeological monitor who watched for burial sites, cultural materials, culturally modified trees, rock formations, earthworks, rock art, subsistance features, transportation routes, and evidence of habitation such as pithouses and house pits. This work is planned for summer 2016 so that impacts to fish during construction can be minimized. Provincial Water Act and Wildlife Act approval applications have been submitted. Stage 2 of the Phase-1 MCRI construction project will focus on restoring fish habitat within Mission Creek and the expanded floodplain. This involves creating meanders and pools along the south bank of Mission Creek, and will utilize trees removed during setback construction to provide overhead cover and bank stability. Each meander will be about 30 metres long and 5-8 metres wide. In addition, one-metre deep pools will be excavated along the edge of each meander to provide rearing habitat and refuge during low-flow periods. To help restore the natural state, logs and woody debris will be placed where the old dike was, and the old dike’s footprint will be planted with indigenous riparian species. The banks of the new dike will also be seeded with native species. In subsequent years, provincial staff and contractors will monitor the effects of floods on the new floodplain to determine if additional connectivity between mainstream and side channel habitats is required to prevent fish stranding in the side channel as flows recede. A meander and pool being notched from the creek bank where the trees have been topped, will provide critical kokanee rearing and refuge habitat. Thanks to all MCRI supporters! Phase-1 funding of approximately $510,000 was provided by City of Kelowna, Freshwater Fisheries Society of BC, Habitat Conservation Trust Foundation, Kelowna and District Fish and Game Club, Oceola Fish and Game Club, Okanagan Basin Water Board, Peachland Sportsmen’s Association, Province of BC, Recreational Fisheries Conservation Partnership Program, Regional District of Central Okanagan, and Trout Unlimited Canada (Okanagan Branch). In-kind support was provided by Copper Sky Productions, Dobson Engineering, Ecoscape Environmental Consultants, Golder & Associates, Interior Land Reclamation, Okanagan College, and UBC Okanagan.